We’ll add a request spec to ensure that this code is well integrated. We already have RSpec and Capybara set up in our gemfile and an empty request spec where we’ll write the test for validating a credit card number. If you’re unfamiliar with request specs take a look at episode 257 which covers this topic. Our first test will visit the “new order” page, fill in the credit card number field with an invalid number then check that the page has the content “Invalid card number”. fill_in "Credit Card Number", with: "1234"
It’s common when using PhantomJS to call require('webpage').create() to return a new page object and we do that here and assign the result to a variable. We then call open on this and pass it a URL. When the page has loaded it triggers a callback function that takes a status argument and for now we’ll just print this value to the console and then exit from script. To run the script we pass the file to the phantomjs command. When we do it visits our Rails application in the background and returns success as we expect. When we run this script we’ll see the title of our application’s home page. There’s a lot more we can do when using PhantomJS directly and the API Reference has more details. To use it as a driver for Capybara we can use the Poltergeist gem which does just what we need. Setting it up is straightforward: we just add it to the test group in the gemfile then run bundle to install it. As we’re using RSpec we’ll modify the spec helper file next and add these two lines below the other require statements. When we run our specs again now they’re run in the background without a browser window showing and this time they pass. It seems that Poltergeist does trigger the blur event when it fills in the field. What if we want to try testing something a little more difficult? We have a page that shows a list of orders which uses endless pagination like we used in episode 114. When we scroll to the bottom of the page the text “Fetching more orders...” appears until the next page of results is fetched from the server via an AJAX request. 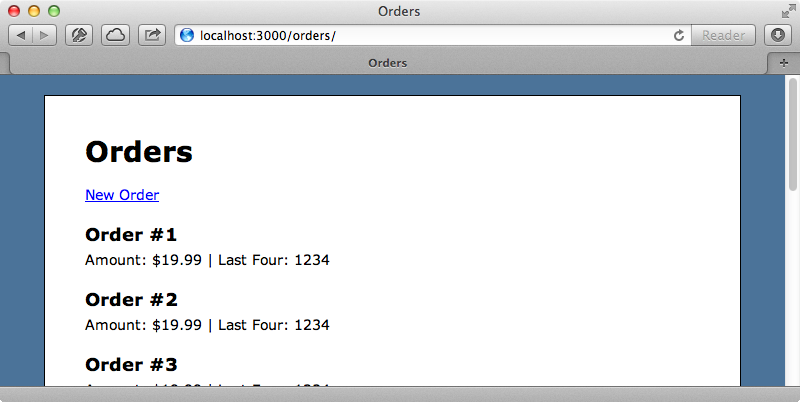 We’ll use PhantomJS to test this behaviour by adding another test to our orders spec. Our orders page displays ten items per page by default so we first create eleven orders in this test and give each one a number from 1 to 10. We then visit the orders page and check that the text “Order #1” appears there. 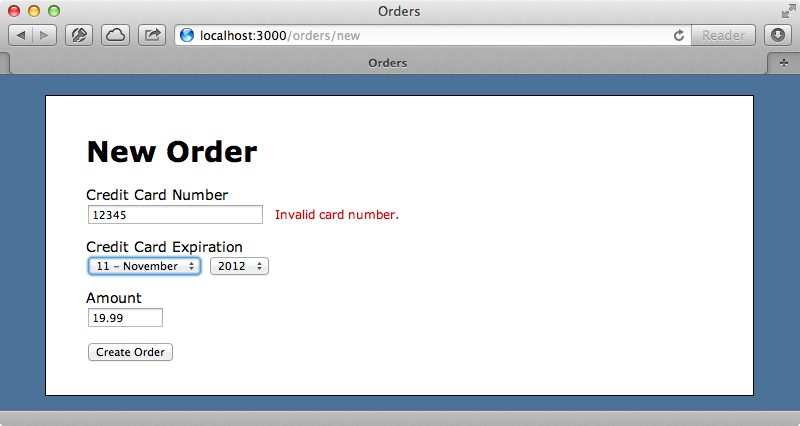 When we run this test it fails and the error message suggests that the page doesn’t contain any of our orders. The issue here is that each test is run in a separate database transaction. If we look in the spec helper file we’ll see that there’s a use_transactional_fixtures setting set to true. This doesn’t work with PhantomJS because this runs in a separate process which uses a separate database connection and so won’t use the same data as the test suite. To get around this we could set this value to false and clear the database in a different way such as using the Database Cleaner gem like we did in episode 257. An alternative solution is presented by José Valim on the Plataformatec blog. There he demonstrates some code to share the database connection across processes which means that PhantomJS will the same database records as our tests. This means that we can continue to use transactions for each test which will make the test suite run more quickly. We’ll add this code to a new file in the /spec/support directory. # Capybara because it starts the web server in a thread. When we run our specs now they still both pass so it appears that our endless scrolling behaviour is working. That said it’s not the best situation when tests stay green after they’ve been modified. We want to be sure that the scrolling is being tested correctly so we’ll comment out the code that fetches the next page of orders when we scroll to the bottom of the page. When we do this we get a failing spec so we can uncomment the code again knowing that it’s being tested correctly. Poltergeist isn’t the only way to run PhantomJS. There are a number of other projects available depending on which test framework we’re using. A list of these can be found here.